Registration for the The Long Walk, 2012 is now full! Don’t despair, you can still join The Long Walkers (and Snoqualmie Floodplain Cabaret) on Friday, July 27th for the Mid-Point Mash-Up, an open-to-everyone event at McCormick Park in Duvall, WA. 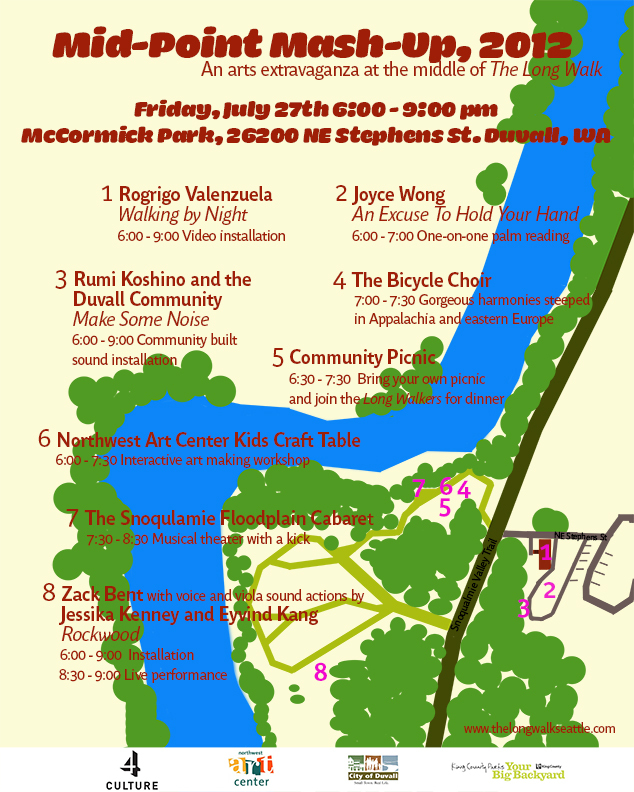 Come cheer on the Long Walkers on the second day of their journey and celebrate summer with residents of Duvall at the Mid-Point Mash-Up. Bring something for the grill – it’s a community BBQ too! And, if the sun has been shining, be sure to pack a bathing suit for an evening dip in the river. will the swales be at the midpoint mashup?